To layer ingredients: 1 9×13 inch pan. Thin layer of meat/bean mixture, tortillas (cut to fit pan), then cheese. Then repeat: meat/beans, tortilla, then cheese. Bake in 375 degree for aluminum pans, 400 for glass for about 15-25 min. Or until cheese on top is bubbly. Modifications: I didn’t want such a huge batch, so I made this in a 8×8 pan and froze the other half of the mix. Time to table: an hour of prep (some is simmering) and 25 minutes baking. Notes: This is a meal that was brought to our neighbors who also have a new baby, and shared with us. We both loved it so much we had to get the recipe from her friend Karen, who apparently adapted it from a Rachael Ray recipe. I further adapted it from what she sent to include a sweet potato and to reduce the amount of meat. The original also called for corn, but I didn’t have that so did not include. 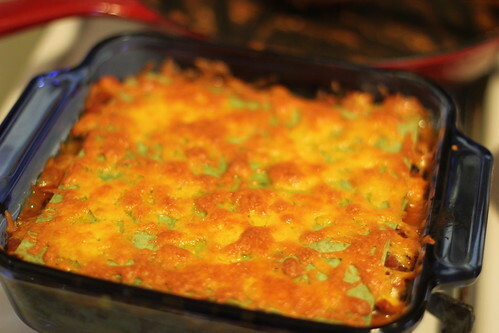 There is another Mexican lasagna recipe on the blog too, but I preferred this one. 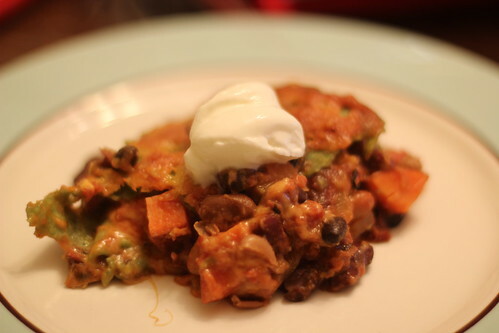 This entry was posted in black beans, cheese, garlic, Mexican, one dish meal, onion, pinto beans, sweet potato, tomatoes, turkey. Bookmark the permalink.